I feel like I speak a foreign language when I go to our local grocery stores. Seriously. Every time I go shopping, I either have to correct the cashiers so I get charged the right price for the right item or I get asked what all the vegetables are for. It’s a great opportunity to teach people about the wonders of vegetables and other healthy food, but most just laugh and brag about how much they hate vegetables. It makes me sad. But….I can’t change the world in a day, right? So on to today’s quickie post about my new favorite food: bok choy. I have Lyn over at EscapeFromObesity to thank for introducing me to a baby bok choy recipe she had on her site last summer. I modified it a bit and use regular bok choy (since it’s all I can find around these parts), so I thought I’d share the recipe I tested (and adored) yesterday while waiting for Mr. Elliptical Fix-It Man to fix my elliptical. Which he couldn’t. Again. This was his third try, too. Poor guy. Said he’d be back next week with another part. I just wish he’d bring me a new machine. Spray a large fry pan with non-stick spray. Sauté the onion and garlic for a few minutes until slightly brown. Add oil, almonds and pepper flakes and stir fry for another few minutes. Add the bok choy and stir until the dark green leaves are wilted. You’ll want the white stalks still crisp. That’s it. Very simple and very healthy: 8 ounces of bok choy has just 30 calories, only a trace of fat, 5 grams of carbs, 3 grams of fiber, nearly 4 grams of protein, 240 mg of calcium (that’s nearly 25 percent of daily recommended calcium intake for women 18-50) and 570 mg of potassium (strive to get 4,700 mg a day). I’m going to add bok choy like I would spinach to vegetable soup and eat it as is in a salad, too. The key around my neck of the woods is finding bok choy that doesn’t look like it just got off a 2-year boat trip from China. It’s that way with leeks, too. But I won’t get started on that. Promise. So tell me, are you experimenting with new foods this new year? What are some of your favorites? I’m always looking for new food finds. Thanks for sharing! This entry was posted in Uncategorized on January 10, 2009 by Lynn Haraldson. can’t do tree nuts because of migraines. and I am curious if you have an alternate suggestion. we eat lean turkey and lean chicken and eggbeaters and fish (mostly salmon) but no beef or pork. everyone at my house is willing to be more veggie – but I can’t quite figure out how to do this without tree nuts. ideas?And I wanted to say that we are eating a WIDE variety of produce these days and one of the tricks I have learned is to have the girls try a bite of something NOT at meal time. Trying something new at meal time involves an audience and pressure. I am having MUCH better luck with handing them a bit of something and saying – I just got this to try – here’s a bite – see what you think. When I am at the grocery – I literally stop and look around and think – what have we not yet tried. My husband and I are pretty much game for anything – and girls are slowly getting better. Hey thanks for the shout out!! Love the bok choy!Let's see. My fave veggies at the moment are: fresh beets, sauteed beet greens, roasted green beans, kale chips. I adore butternut squash (cubed, steamed, salt&peppered, with just a bit of smoked cheddar melted on top) and baked acorn squash. I use tons of baby spinach from breakfast to dinner. And of course my favorite: leeks! I have leek recipes on my site if you haven't tried them, but leeks & asparagus is seriously my favorite veg ever. 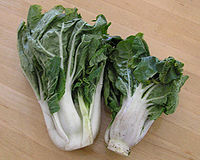 OK, dumb question, but what does bok choy taste like? My new favorite recipe is Taco Soup (would be totally vegetarian if you made it with vegetable broth rather than chicken broth), but I’m going to roast some cauliflower tonight…I’ll let you know how it turns out. I love bok choy when I can find it. I first tried while living Japan of all places and didn’t find it here until years later. We don’t get it here often but when they do I use a lot of it! Thanks for the recipe. I will try it. I think that I have steamed bok choy and then used it to roll other steamed veggies with lots of hot chinese mustard for mock egg rolls. I use all kinds of cabbage types for this and I think (seeing your pic) that I have used bok choy too. Vickie: try soaking the nuts in water up to 24 hours in a covered glass container. It pulls out the component that I’m allergic to and I can eat tree nuts now.Grocery Store – I’ve had those conversations too! And I always wonder why the cashier is so amazed by a product that is sold, out in the open, in the place where he/she works. Surely I’m not the only person buying tomatillos?! ?Thanks again for another great post. Vickie, that’s a great idea for getting your kids to try new things. Why DO we force it on kids at the dinner table? lol It really makes no sense. As for nuts, LindaB’s idea sounds good. I rarely eat nuts, actually. I get my protein through egg whites, soy and some dairy. There’s a lot of protein in vegetables, which most people aren’t aware of. I’m a big fan of beans, too. Black, pinto, you namem it. Lyn, I love cooking with leeks and I LOVE asparagus. Just ate a big portion last night, roasted with parmesan. Yum! Shelley, I’m trying to think how to describe bok choy. It’s very mellow and the white stalks are crunchy, but again, mellow tasting, not like celery or anything. It’s not really sweet, either. It’s a little like bib lettuce, actually. LindaB, I forgot about tomatillos! hehe Yeah, it floors me how little people know about food. If it doesn’t come in a microwavable box with a picture on the front….oy. I need more veggies for sure. You and Lyn always make them sound so romantic and delicious lol. I’ll keep trying. I just got hooked on Spaghetti Squash and am in love!!! Hanlie, you must live in my town! LOL. The week before Thanksgiving, my produce guy looked at me like I was nuts because he had no cranberries. I have to drive 2 hours to shop in a co-op where the produce guy can converse intelligently about endives.Forgot to mention previously, my latest fav is kale. Especially like it dried into “chips” – plain or with a coating of spices and tahini (peanut butter is a decent substitute in a pinch).